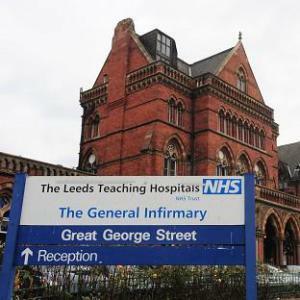 More change at the top of the Leeds Teaching Hospitals NHS Trust, the organisation that runs Leeds General Infirmary and St James’s. Finance Director Neil Chapman is the latest to leave, the announcement coming just weeks ahead of a new permanent chief executive taking up his post. It’s been one heck of a shake-up at the Trust this year. Since late spring they’ve acquired a new medical director, a new nursing director, and a new chief operating officer. New chief exec Julian Hartley takes over in October from interim chief exec Chris Reed, who himself took over in June after the sudden (and still unexplained) departure from the post of Maggie Boyle. Departing along with Reed in a couple of weeks time is his wife Karen Straughair, who was brought in as “recovery” director at the time of his interim appointment. Reed’s farewell report to the Trust’s board says that, as well as Chapman, “a number” of the finance team are also leaving, many to better paid work at the National Commissioning Boards. “Neil has been in Leeds Teaching Hospitals for many years and his loss to the Trust in terms of corporate memory as well as his unerring ability to always bring the money in line with what is expected will be deeply missed,” the report says. The finances of the hospital were a big worry last year, and this year things aren’t looking great either. The Trust needs more money in the bank if it’s to apply for coveted foundation trust status. With that in mind it planned to end the last financial year with a surplus of £8.6m, but only managed £1.5m, in part because of the penalties it incurred for failing to meet A&E waiting times targets. Reed’s report to a board meeting this Thursday (26th September) says “finances remain a concern”. “Our income and expenditure are currently not aligned,” it says. “Despite the hospital being busy, our prediction for income has not peaked in the way we predicted. “The problem we face is borne from a series of complicated but very important financial assumptions we make about how much activity we will be asked to do in all our speciality areas. Chapman, who had been finance director since the Trust was set up in 1998, is leaving for a job at the Trust Development Authority. This entry was posted in Uncategorized and tagged hospitals, leeds, leeds teaching hospitals nhs trust, maggie boyle, neil chapman. Bookmark the permalink.